This image shows a biowire making an electrical connection between two electrodes. Image: UMass Amherst. Scientists at the University of Massachusetts Amherst have genetically designed a new strain of bacteria that can spin out extremely thin and highly conductive wires made up solely of non-toxic, natural amino acids. They report this work in a paper in Small. Rivaling the thinnest wires known to man, the ‘biowires’ are produced from renewable, inexpensive feedstocks and avoid the harsh chemical processes typically used to produce nanoelectronic materials. "New sources of electronic materials are needed to meet the increasing demand for making smaller, more powerful electronic devices in a sustainable way," says microbiologist Derek Lovely, who led the research. The ability to mass-produce thin, conductive biowires could lead to many potential applications in electronic devices, where they could function not only as wires but also as transistors and capacitors. As such, the biowires could find use in biocompatible sensors and computing devices, and as components of solar panels. This advance began a decade ago, when Lovley and colleagues discovered that Geobacter, a common soil microorganism, could produce ‘microbial nanowires’, electrically-conducting protein filaments that help the microbe grow on the iron minerals abundant in soil. However, although these microbial nanowires were conductive enough to meet the bacterium's needs, their conductivity was well below the conductivities of organic wires that chemists could synthesize. "As we learned more about how the microbial nanowires worked we realized that it might be possible to improve on nature's design," says Lovley. "We knew that one class of amino acids was important for the conductivity, so we rearranged these amino acids to produce a synthetic nanowire that we thought might be more conductive." The trick they discovered to accomplish this was to introduce tryptophan, an amino acid not present in the natural nanowires. Tryptophan is a common aromatic amino acid notorious for causing drowsiness after eating Thanksgiving turkey. However, it is also highly effective at transporting electrons at the nanoscale. "We designed a synthetic nanowire in which a tryptophan was inserted where nature had used a phenylalanine and put in another tryptophan for one of the tyrosines. We hoped to get lucky and that Geobacter might still form nanowires from this synthetic peptide and maybe double the nanowire conductivity," says Lovley. The results greatly exceeded the scientists' expectations. 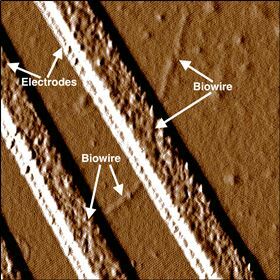 Their genetically-engineered strain of Geobacter could manufacture large quantities of biowires that were 2000 times more conductive than the natural biological nanowire. An added bonus is that these biowires have a diameter only half that of the natural nanowire. "We were blown away by this result," says Lovley. The conductivity of the biowire exceeds that of many types of chemically-produced organic nanowires with similar diameters, while their extremely thin diameter of 1.5nm means that thousands of the wires can easily be packed into a very small space. What is more, these biowires do not require any of the dangerous chemicals that are needed for the synthesis of other nanowires and contain no toxic components. "Geobacter can be grown on cheap renewable organic feedstocks so it is a very 'green' process," Lovley notes. And although the biowire is made out of protein, it is extremely durable: Lovley's lab had to work for months to establish a method to break it down. "It's quite an unusual protein," he says. Researchers in his lab also recently produced more than 20 other Geobacter strains, each producing a distinct biowire variant with new amino acid combinations. "This may be just the beginning," Lovley predicts. "I am hoping that our initial success will attract more funding to accelerate the discovery process. We are hoping that we can modify biowire in other ways to expand its potential applications." This story is adapted from material from the University of Massachusetts Amherst, with editorial changes made by Materials Today. The views expressed in this article do not necessarily represent those of Elsevier. Link to original source.